Posted on February 13, 2019 by Teagan R. Geneviene •	This entry was posted in Hidebound Hump-Day, Teagan's Books and tagged Copper the Alchemist & the Woman in Trousers, Cornelis Drebbel, Fantasy, Pantser, Purple, Steampunk, Tea, Teagan Riordain Geneviene, Valentine's Day, Victorian Era, Vintage. Bookmark the permalink. I had forgotten about the one eyed purple people eater…..then the song came into my head and seems to be taking up residency! LOL…Have a great week Teagan…. Oops! Sorry about the ear worm, Kirt. 😀 Heartfelt thanks for visiting. Hugs on the (purple) wing! Are we there yet? – Sometimes you’re in a hurry to go somewhere, but you realize only afterwards that it was/ is the journey that counts…This lovely episode reminds me of that. Do enjoy the latest episode of Copper, the Alchemist, and the Woman in Trousers 30 — Babylon, Toothpick, Alpine. And have a fantastic weekend, everyone. Teagan, once again thanks for letting me re-blog. I love what you’ve done to the place/ story. Dear Melissa, thanks so much for sharing from your place. I’m so glad you are on this crazy steampunk submarine. Mega hugs. Haha. So glad you like that part, Jennie. While it wasn’t one of my “things” somebody somewhere mentioned it, and it got into the spontaneously written story. Happy weekend hugs! I never heard this song before! Thanks, Teagan! Happy belated Valentine’s Day to you and Crystal. I’m glad I could introduce you to a fun song, Lavinia. Have a wonderful Wednesday. ❤ 💜 Hugs on the wing. I like the Victorian Vernacular, a lot. I must say your tale is very unique. You have a wonderful imagination! Hi Resa. Thanks so very much, my chuckaboo! “Unique” really is hard to achieve. The slang of bygone eras is a fun challenge. I try to only use it in a way that the reader can get the gist of it without looking it up. Somehow, I found that much easier to do with Flapper slang than with Victorian. I appreciate your visit. Great big hug! Hi Adele. Thanks so much. I hope you and Becca enjoyed a lovely Valentine’s Day. Thanks for taking time to visit. Mega hugs! The tension is mounting, Teagan. Lets hope they don’t outstay their welcome in the purple world. Who’d have thought that toothpicks would have much use other than removing food from between teeth, Teagan? That was such a unique way to weave ‘toothpick’ into the story. I’d forgotten all about the alpine goat, but I never forgot about the brilliant cliffhanger this episode of the story had. It was etched firmly on my mind from the first time I read it. Dear Hugh, you are so very kind. Thank you! I appreciate you taking time to visit. LOL, I wish I knew how or why these things come to me. Thanks so much, John. The slang is fun. Some episodes, it’s hard to match up “real world notes”… the duffel bag was a bit of a stretch. I was thinking of Absinthe and his “sea bag”. So I’m glad to know you liked that. Thanks for being on this crazy submarine. Mega hugs! Nice to see you use one of Rob’s pieces again. Loved the old world vernacular and their meanings at the end. I am still purging, but I’m rounding up boxes and starting to pack! Are you? Right now I’m thinking I’ll trade ya! I know you have a lot less purging and packing to than I do. I’m so glad you enjoyed it, Deborah. Ha! I wouldn’t count on that. A household needs the same things whether it’s for one person or an entire family. So don’t think I have it any easier. I’ve been in this place ten years. Things accumulate — and I swear they hide. Of course the bulk of mine was from the fact that I’m a clothes hound. I’ve loved clothes since I was a little girl… But I’ve donated 4/5 ths of my clothes. All my dishes. All the linens, except the one set to use. 99% of my books. It was all very difficult, because I won’t have the money to replace those things. I have one more donation scheduled, for more clothes (and books) I’ve weeded out from the final 1/5th I “couldn’t part with”. All my stairs add to the difficulty. I have a small, narrow rowhouse, with 3 levels. And unfortunately no bathroom on the living level. My knees have started to complain about the stairs during the past year. So I am very glad the cottage is only one level! If my knees and back will just last until I get there. Oh my, you’re doing ever so much better at letting things go than I am! I hope when the dumpster arrives I am able to get more things in there and into the donate pile! I’ve been trying to sell somethings, and freecycle quite a bit, but not enough, and that process is slow going. Amen to no stairs! I’ve always lived in a single story house, and now that I’m older I don’t want to start living in a 2 story one. The kids always wanted a two story house, but the stairs and upkeep of one seemed too daunting for this slug at heart. Baby Girl has a two story house now. #1 GS loves the stairs, but already Baby Girl is seeing the wisdom of our choice to have a single story house. Tee-hee! 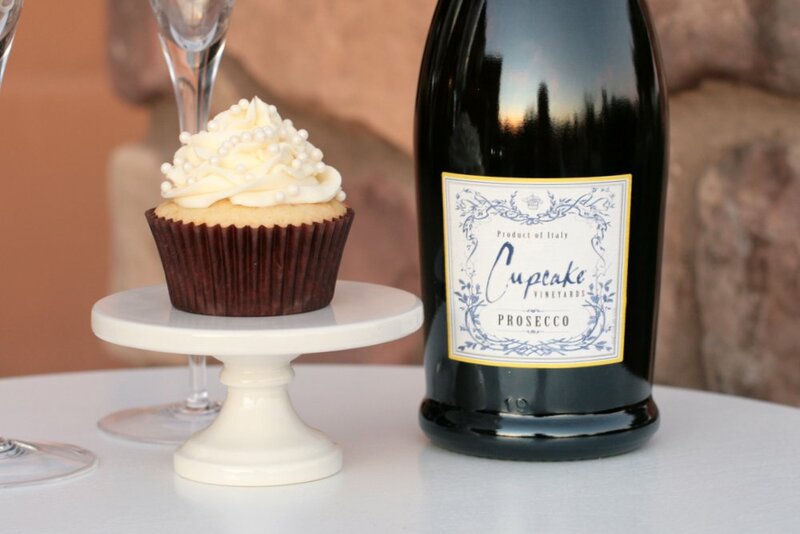 We can celebrate with a bottle of my current favorite, Cupcake Prosecco — and even the cupcakes, since my egg allergy doesn’t interfere with virtual food. As a child I was fascinated by homes with stairs in a romanticized way (because we didn’t have them). It’s a good use of vertical space. But the combination of my small place on 3 floors, but no bathroom on the living floor — and chronic bladder inflammation has been brutal on my knees. Crystal has short legs, and at 12, she seems to be less enthusiastic about the stairs too. I will be glad to say goodbye to those stairs! Cheers! I’ve never had a goat, but I think they are adorable. Although I was surprised when my research (looking for how to relate Alpine to the Victorian Era), on a fluke took me to the Alpine goats. Of course, I couldn’t resist. I’m honored for you to share my response to your February prompt! I have tried so hard to write a (ANY) Valentines story this year, and it just wouldn’t happen. I thank *you* for letting me use them Rob. I couldn’t resist the ones with purple in them for this part of the story. Mega hugs, my chuckaboo! Please feel free to use them. I’m always honored when you do. LOL! I love that last line, Teagan. What a cliffhanger! I can see him doing a silly walk. Happy early Valentine’s day, Teagan. Purple goat pets, oh my! The toothpick holder made me think of the canaries miners used to warn them of impending doom. This story is so good, Teagan! Ready for the big move? Still working on it, Jacquie. It’s a lot for one person. But I’ll get there — if my back and knees hold up. LOL. I still have some packing and purging to do. There are 3 parts (piano mover), “junk” removal (for my furniture and things I couldn’t arrange to donate), and UPS to do a consultation and then pick up the boxes of my stuff. As of today those are all scheduled over the course of 2/17 to 2/26. Then I need to wrap up any unexpected details and hit the highway by the end of the month. I say all that, but meanwhile my agoraphobia is in hyper drive. Saturday I went a mile away (which is the limit of my comfort zone) to the grocery store. That was the first time I had gone anywhere since *December 31*. I’ve got to plan my route, and I lock-up whenever I try. I really hate what this place has caused me to be. You and your honey have a lovely Valentines Day tomorrow. My level of concern is growing, Teagan. I was eager enough for our crew to get out of here before meeting their doppelgangers and now you’ve simultaneously introduced the concern that they might be trapped and that of the flying people eater. I have to confess to getting nervous along with Absinthe when the sub started turning purple. I hope the toothpick holder is as good as the old canary in the coalmine, and that we don’t see it starting to turn purple. I love the image of the Lost De Milo, and I also really like: “Cornelis suddenly appeared at my elbow. He knew it annoyed me when he did that. It never failed to be disquieting, and it always entertained him to startle me…” You’re keeping that vibe between these characters alive. Kudos on introducing the goat! Until next week, we hang at the edge of another cliff. Thanks so much, Dan. That means a lot to me. I’m glad you added that about the goat. I like including at least one animal in my stories — they are an easy way to add whimsy and the unexpected. But pantser serials take me where the “things” lead. I don’t know what Christoph had in mind with “Alpine”. So I went researching, since I couldn’t think how it might relate to the Victorian Era. Through a fluke I landed on the Alpine goats. I appreciate you taking time to visit. Mega hugs! Oh my, Teagan! You have such a talent for creating endearing characters. I’m already in love with the purple ape and now the lavender goat! What next? Great segment! I kind of want a lavender goat now…lol. I’m curious what they will find in the lab and learning more about the purple people eater. LOL, I get a kick out of goats, Denise. Without intending to, I’ve mentioned them in several stories from my very first (unfinished) novel. Thanks for hosting my doodles. They send their love! Heartfelt thanks for reblogging, my chuckaboo! Mega hugs. It’s time for Hidebound Hump Day — Cornelis Drebbel 30 from this post on Teagan’s Books Blog. Heartfelt thanks for reblogging from your place, Don. Mega hugs! I think a purple world sounds lovely! Great episode Teagan. I’m relieved you haven’t grown tired of purple, Fraggle. I was ready for some green and yellow long about this point, but it still took a while for me to write my way out of this lavender corner. Huge thanks for being on this crazy submarine. Mega hugs! I was taken with the gazebo-shaped toothpick holder before I even realized it was a magical warning device. And, as usual, you ended with a whopper! Can’t wait for the next installment. Thanks so much for being on this crazy submarine. Mega hugs. I just knew that people eater would show up again. Hugs, Teagan! Yes, Teri… it was inevitable, wasn’t it? Thanks for visiting, my chuckaboo! Mega hugs. What a roaring good time Teagan! I was laughing with delight at this episode and of course, you had to end with purple people eaters. For Valentine’s, I’m going to don my purple gal-sneaker cape, but avoid those church-bells! Happy Valentine’s hugs and laughs! Tee-hee! Your laughter is music to my ears, Brad. I think a purple Valentine’s Day would be lovely. Hugs on the wing. Heartfelt thanks for sharing from your place, dear Magician. You’re the cat’s pajamas. Mega hugs! Thank you kindly, Michael. I’m happy you thought so. It really did remind me of Cornelis. I appreciate your visits. Huge hugs! Thanks Priscilla. Happy Valentines Day (a little early)! A fabulous episode and I couldn’t agree more about Christoph’s books (and his puppies!). Thanks, Teagan! And I’m up next week! Exciting! Hi Olga. I was wondering if you’d seen the pups. Although, I guess they’ve been placed in their new homes by now. I hope you have a lovely stay there. Thanks so much for visiting, and for sharing on Facebook. Mega hugs! Thanks for being on this crazy submarine, my chuckaboo. Mega hugs! Hi Joanne. That’s really kind of you to read the comments. Yes I am. On December 31st I turned in paperwork for an early retirement. Mostly because of job stress, my tendency to be rather agoraphobic has become utterly crippling. Now that (as of this week) I’m officially separated from a real career, I’m beginning to blog more freely about it. You may have seen other “hints” in comments here, but mostly at other blogs. Thanks for being so supportive. More hugs. I’m happy for you that you are leaving an environment that is toxic to your well-being. I suspect you won’t feel the full extent of it until you start to recover in a new, gentler place. I hope you have a strong, reliable friend or group of friends to help you through this transition. I applaud your courage to face your fear and undertake this journey. I will look for you on Facebook, but to be honest, I’m not a regular there. That energy means a lot to me, Joanne. Heartfelt thanks. I particularly like the image of the toothpick holder as the canary in the mine shaft. Excellent foreshadowing! Thanks so much for your feedback, Barb. That means a lot to me. Having made the “harmonic tuner” look like a bell from the era, I wanted another everyday item I could add to Cornelis’ collection of magical doodads. When Christoph left “toothpick holder” I found an image like the one I described. It used to be on the Pinterest board I was making for this serial, but I think the pin was removed.